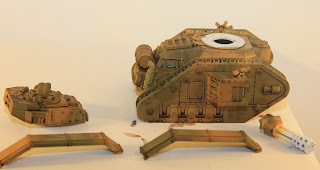 All of this weathering must come to an end! 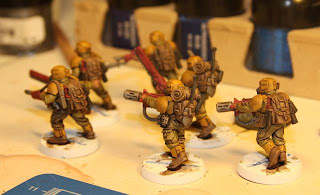 I took a break from weathering my vehicles into the hands of nurgle, and instead painted an IG Vet squad. My goal was to paint quickly without any worries. 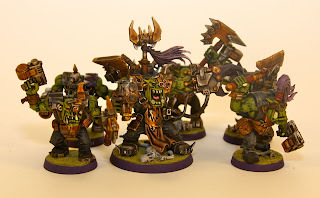 I will probably use the squad as part of my new DH army. There is something really satisfying painting at light speed. 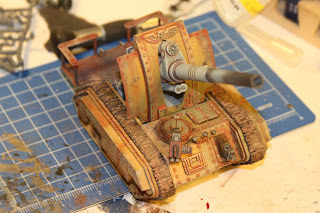 I enjoyed a happy hour with colleagues a mojito, and then came home and weathered a tank. I don't know what it is about this process that is so cool to me. 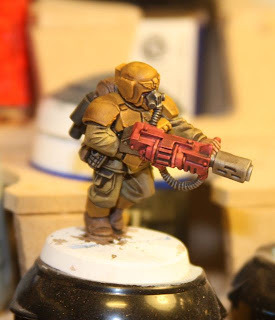 This time I took a lot of tamiya acrylic and mixed it with a very small amount of red dust from forge world. 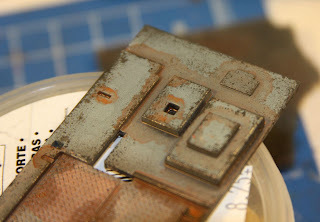 I took the rust wash and then put it around each bolt, crease or area that I thought would rust. It looked pretty rough initially, but I am happy with it now. 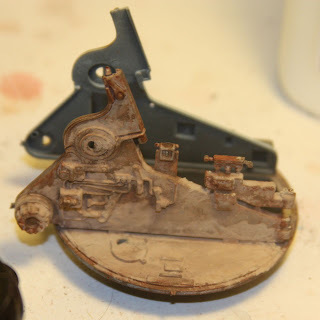 One of the things I am trying to learn is when to stop weathering a vehicle. 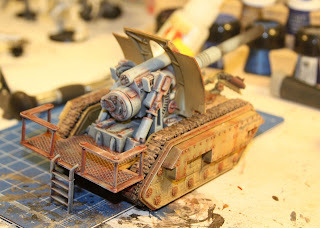 This poor artillery piece looks like it hasn't seen the inside of a shop since its production line. 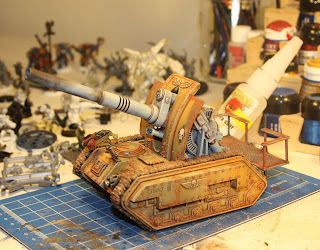 The problem with weathering this way is that it is pretty easy to make something look derelict like this, but much more difficult to paint up a tank that is well maintained but weathered. 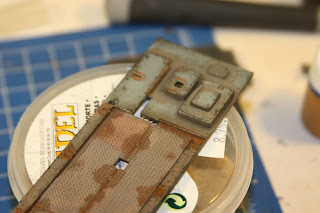 Weathering adds so much texture it is amazing, but I think it lends itself most easily to renegade forces. One more change from my weathering routine, I brushed light earth colored weathering powered all over the vehicle simulating dust. 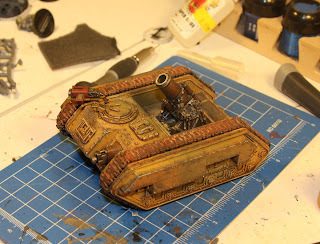 So after all of those painting tests, and finding a weathering scheme I liked, I just went ahead and weathered the tank differently. 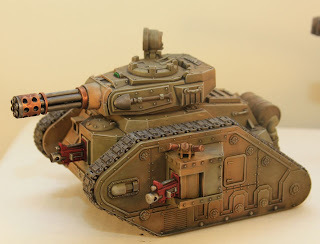 I am pretty happy with the tank, especially given this is a repaint without simple greening. This tank used to be grey, not it looks like some Ad-Mec nightmare. I mean, who takes care of this thing, and why do they let it look like this! 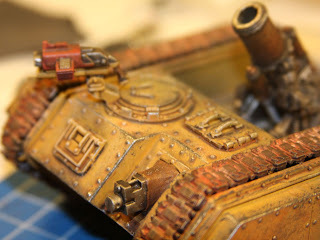 I am point to put up more of my weathering shots one tank at a time! I learned a few things about acrylic paint thinner this morning. (yes I know just before going to work is not a good time to model) If I use it on extremely smooth surfaces it has almost no water tension and it just flows everywhere. It is pretty hard to get it to stay where I want it to. 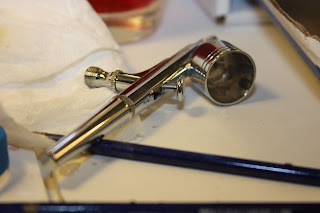 I am going to switch back to using water as my thinner for rust areas, and use the acrylic thinner for things like oil stains. 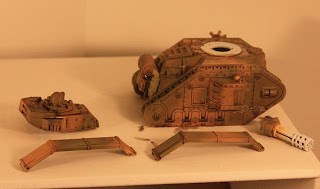 I am almost ready to weather all of my IG tanks, using the photos above (except the muddy test--too much FW powder!) I've got to thank Santa Cruz Warhammer for prodding me along! 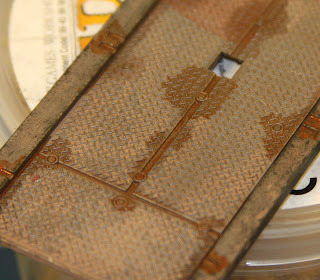 He has an excellent series of weathering examples using the master model book from forge world. I am using slightly different techniques, but mostly because I do not have the patience for salt dips. 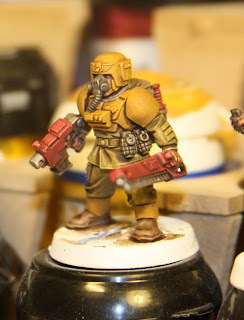 I am beginning to think that I should paint up a space marine as cleanly as possible, and then apply the paint chipping and dusting techniques I've learned to his legs and shoulder armor. 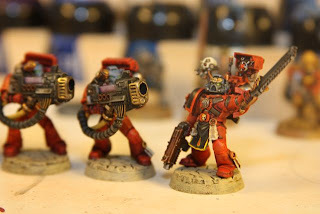 I pulled my guard and tanks out of their display cases this morning, and hit the local GW store and play an honest to god game of 40k. That punisher that I had built because it looked cool turned into the MVP of the game. Everyone told me how terrible it was as a tank, but it was fun to roll that many dice, and the tank acted like a fire magnet. I am tempted to give it some painted on victory art, or a purity seal or something. Using a screen of 5 rough riders was also pretty useful. They ran in a straight line in front of my tanks providing a meat shield/cc counter. We played a ruined city game, my mechanized guard against a raider dark eldar force. My tanks just pounded the dark eldar, dropping their vehicles and pinning them with barrage hits. 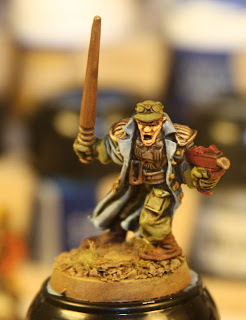 My opponent was trying out his new DE ebay purchase, and I think he was not playing with all of his models yet. I lost only a single guardsman to a mishap jumping from a valk which arrived turn 5. 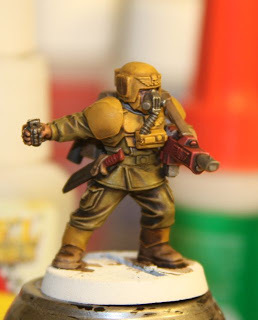 My primaris psyker was able to drop one of the armored DE gunships with his mind, which opened him up to me as a useful unit. 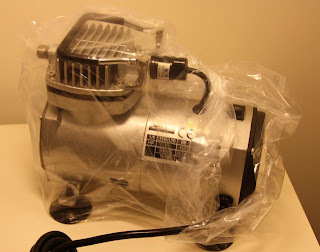 I bought an airbrush a while back, along with an oil less air compressor. The brush is dual action, and was a bit intimidating. Last night I decided to put the thing together and see how it worked. 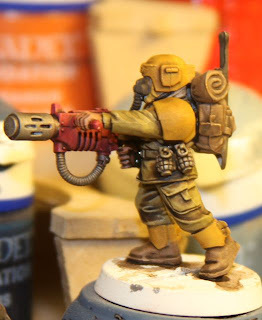 I started by priming a miniature with boltgun metal, basically as a way to test how even the coats were, and to see if this gun would help me paint my grey knights. 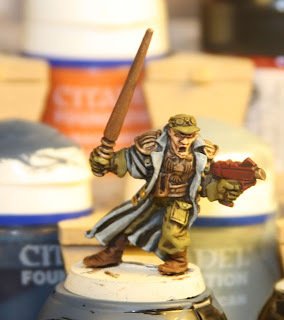 When I got home tonight I decided to try the gun on an Imperial Guard Punisher. I'm told the weapon is useless, but I like the way it looks, so I chose it plus three bolters as my first set of weapons to paint. 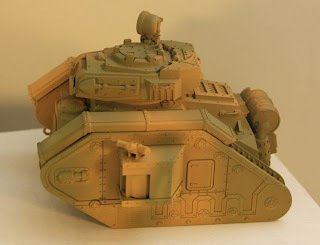 After building the tank I primed it white, and then began giving the airbrush a spin. Most of this model was painted in under an hour! 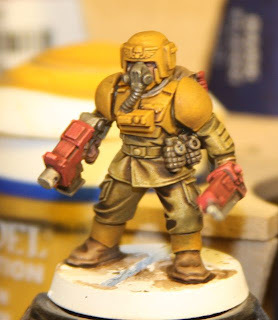 I has taken me two more hours to paint enough other parts (bolters, main gun, and tank tracks) so that I can use this guy tomorrow if I break my gaming fast. I am so impressed with this air brush I don't know what to say. You should just go buy one. 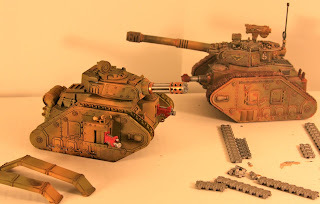 I will never paint a tank by hand again. 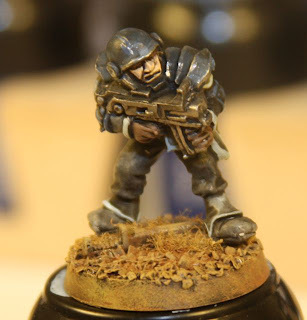 I even liked painting smaller objects like troopers and the bolters with it because it produces such an even coat. 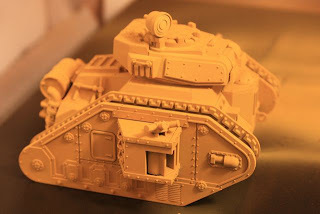 When I have finished weathering this tank I will post some more photos. 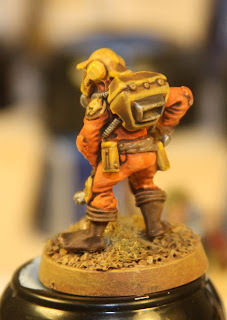 The GW airbrush is already in the trash. *EDIT A word of caution about purity seal. I used it on one of my heavily weathers tanks (not pictured here) and it basically removed all of the soot/rust/ash on the vehicle as well as changing the color of the graphite I used for worn edges. 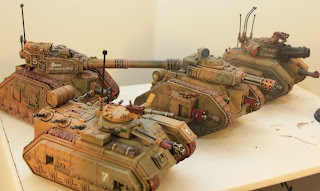 I've posted quite a few tanks, but have not put up many of my actual guardsmen. Since I have been experimenting with light boxes today I ended up with a bunch of units photographed. 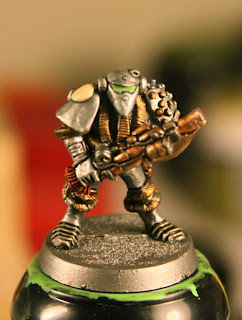 The older minis were all part of my grey with white stripes guard army that had selected models simple greened. The rest are part of a box set that bought as part of a painting competition. 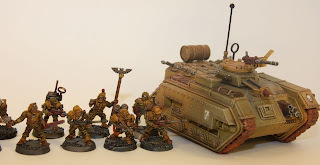 The guardsmen are dirt simple to paint, and I think they look pretty good next to the chimera. I have never fielded this force, but keep meaning to. I had to toss in a shot of the AoBR Orcs. I love those models. 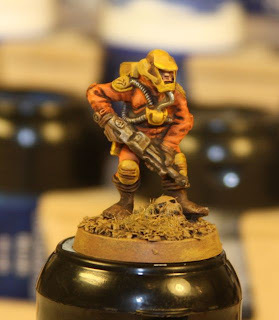 I may paint up another batch in some bad moon colors just because. Finally I have a full squad! 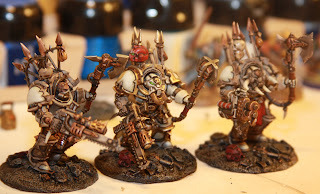 I am not sure if I have just gotten used to the better plastics, but the chaos terminators I painted had very little definition. 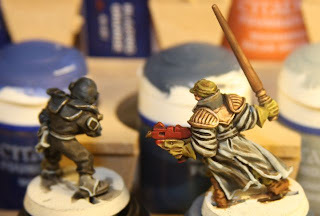 These were really frustrating to paint because I could not scoot my wet brush along any sort of defined line. Is this how they all are? Do plastic molds become undefined like this over time? 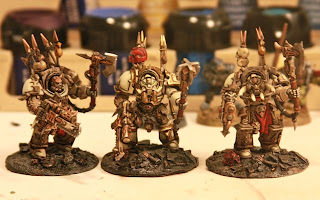 I let the washes work their magic, and presto, my first chaos squad was complete. 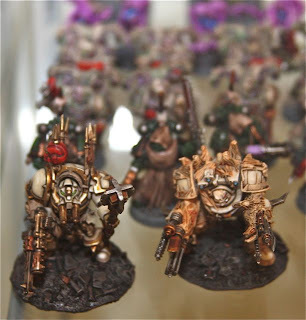 After seeing the forgeworld stuff in person, these blobby miniatures were not nearly as exciting. Hopefully the chaos kit will get updated as a gift to the community! I've had 4 partially painted devastators for a long time. 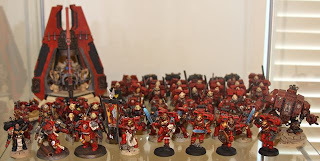 I originally bought them for my Iron Scythes, and then they got passed around from army to army until they received their blood red paint job...last year. This is the problem with starting and not finishing projects. 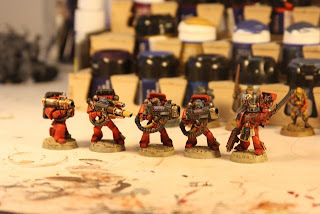 These guys got a paint job when I was relearning painting from the ground up, but since I started them back then, I had to deal with that fact today. Now I have a unit that has all kinds of painting styles and does not benefit from either my new found love for layering and blending or my growing hatred for mold lines and bad priming. 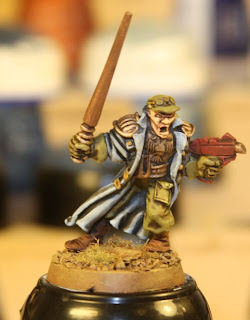 In a hobby like this it is hard to finish units when painting momentum is lost. 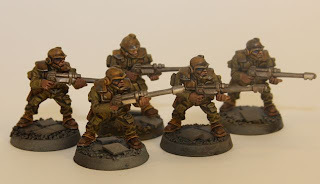 At least they are done, and while not the best looking figures in the army, they at least do not stand out as the mostly primer unit they were. 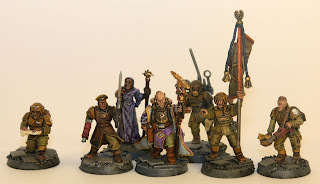 So, does anyone field squads like this. I feel like I have to try them out at least once now that they have a few dozen coats a paint on them. 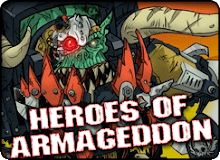 What will one las cannon, two plasma cannons, and one missile launcher do to another unit. 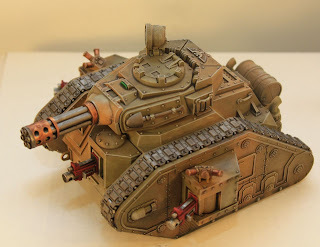 Can I toss this in with my baal and unpainted land raider? 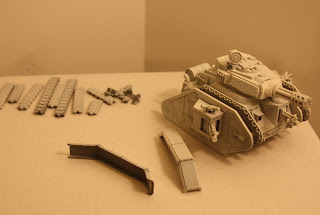 It certainly looks like a fun unit for the shooting phase! 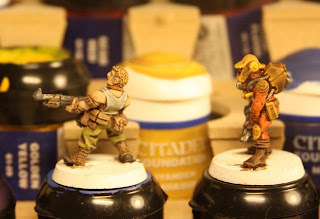 I needed a few miniatures to test paint, so I dug around in my 15+ year old bits box and found these minis. 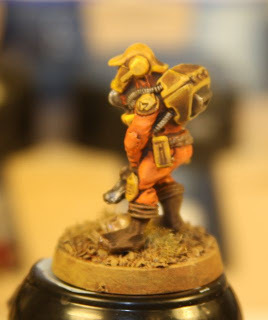 I have no idea what the orange guy is supposed to be, but I painted him up in a star wars suit to see how orange took the dev mud wash. I have never been good at fabric, so the guy with a cloak was an attempt to see what I could do. 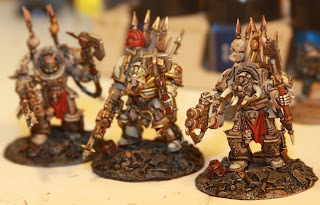 These are not well painted minis. I think I may have learned a little by painting them. Hopefully I did, since that was the point. The question is what to do with all of these guys now. I already have randomly painted orcs that I used for testing!